Owing to the dexterous professionals, we have been able to provide the clients with a commendable assortment of Ceramic & Black Iron Hooks. 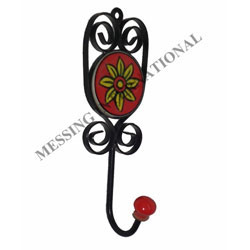 These traditional styled metal hook are finished with a ceramic insert in a variety of styles. The offered range of ceramic & black iron hook have a myriad of colors, styles and finishes a beautiful way of making a functional item into a "Work of Art". We offer those products in market competitive price. Backed by our industrial experience, we 'Messing International' Established in the year of 2000, are an eminent organization engaged in Manufacturing and Exporting a fine quality assortment of Hardware Items, Designer Escutcheon and Mail Boxes. In addition to this, we have Designer Jewelery, Silverware Articles, Napkin Rings and Home Decor Items. The offered products are widely applauded for their intricate design, attractive colors, fine finish, smooth edges, longer service, resistance against abrasion and gorgeous design. With an aim to ensure that our offered products bear the above named features, we manufacture these by making use of high grade raw material and design using modern machinery. We carry out the entire production process under the watch of professionals who are the experts of this domain and aware of the prevailing norms of the industry. The entire production process is carried in a smooth manner, owing to the support of our sophisticated infrastructure. Supported by infrastructure and dexterous workforce, we are able to provide the offered products as per the specifications given by patrons.
" We are looking for foreign inquiries majorly from USA, Canada & Europe."